Harbour Master Classic Slot Review - Casino Answers! 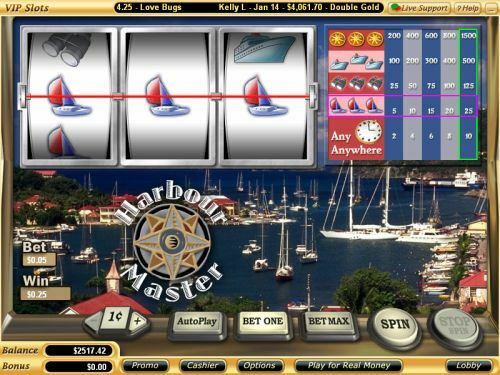 Harbour Master is a 3-reel, 1-line classic slot machine developed by Vegas Technology, featuring scatter wins. You can play the Harbour Master classic slot at Bovada. Bets on the Harbour Master slot machine are $0.01, $0.05, $0.10, $0.25, $0.50, $1, $2, $3, $4, $5, $6, $7, $8, $9 and $10. You can bet from 1-5 coins per spin on the Harbour Master online slot. The Harbour Master penny slot has a very good betting range – you can bet anywhere from one cent up to $50 on a spin. Harbour Master’s betting range is suitable for pretty much any online slots player. You can use the skill stop feature to manually stop the reels. Simply press the “Stop Spin” button in the middle of any spin. To select your bet on the Harbour Master slot game, use the “Bet One” button. To play Harbour Master, select your bet and press “Spin” or use the “Bet Max” button to play the 5-coin maximum bet. The highest paying symbol on the Harbour Master slot machine is the Compass symbol. If you land 3 Compass symbols on the payline on a max bet spin, you will win the 1500 coin top jackpot. If you bet fewer than 5 coins, you will receive a lesser payout, hence why Casino Answers recommends that you play the 5-coin maximum bet at all times on the Harbour Master slot game. There are 5 winning combinations on the Harbour Master classic slot machine. The complete payout schedule is as follows (1/2/3/4/5 coin payouts in parenthesis): any Clock symbols anywhere on the screen (2/4/6/8/10), 3 Sailboat symbols (5/10/15/20/25), 3 Binocular symbols (25/50/75/100/125), 3 Ship symbols (100/200/300/400/500) and 3 Compass symbols (200/400/600/800/1500). Hit “Autoplay” to open up the Harbour Master autoplay mode where you can select the number of spins (5, 10, 25, 50, 100, 250 or 500) and number of seconds between spins (0.25, 0.50, 1, 1.50 and 2). Stop settings include stop once all spins are complete, stop when jackpot is won, stop if a win exceeds or equals ($50, $100, $150, $200 or $250), stop on any win and stop if credits increase/decrease by ($50, $100, $150, $200 or $250). You can cancel autoplay on the Harbour Master online slot at any time. If you’re looking for a decent 5-coin classic slot on the Vegas Tech platform, you can’t go wrong with the Harbour Master slot machine. There are no special features, so if you are looking for them, you may not be too happy with Harbour Master. Otherwise, you can play the Harbour Master slot game when you sign up at Bovada. Where can Americans play the Harbor Master classic slot machine? Americans are welcome to play the Harbor Master slot machine at many Vegas Tech casinos including Bovada.